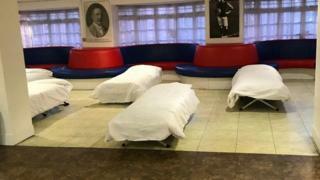 They slept on camp beds which were set up in a lounge inside the club's ground. Councillor Alison Butler said Crystal Palace was "setting a standard for other clubs to follow". "Freezing temperatures are a particular safety risk for rough sleepers and this is a wonderful gesture by Crystal Palace for helping us reduce that risk." Last year, the council approved plans to increase Selhurst Park's capacity from 25,456 to more than 34,000.